We begin with Jiwon getting ready to sleep after the barbecue party. Jiwon: Today, I became a lot a lot closer with unnie. Drinking wine and singing with unnie....it's the first time. Jiwon: I really like unnie. We skip to another night. She's filming herself. Jiwon: There's a lot to do tomorrow. We have to prepare for the party, so we have to clean up and set the house, prepare presents for the guests. It's their last morning in Grasse! After preparing her morning coffee, she starts talking to the camera. Jiwon: I....I'm totally ugly today right? I didn't even wash up. I'm really ugly. The sisters are discussing the menu for the home party. Jiwon: I can't do lasagna. Hahaha I'm highly suspicious as to whether she can actually cook the things she's suggesting. Next is the invitation! I find it so cute how her texts in English have no capital letters haha. 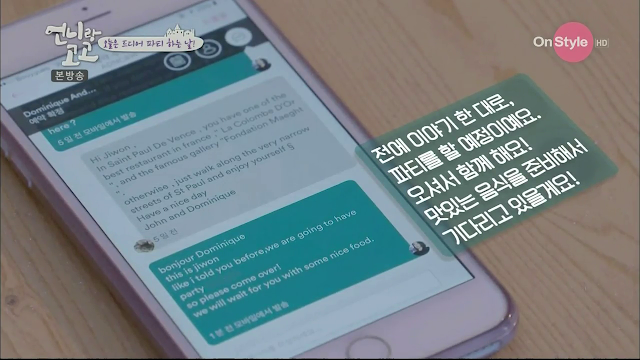 She says that Dominique ahjumma was really affectionate so she wanted to do something for the hosts and she's sad that she couldn't do much for them. The guests are: hosts John and Dominique, their son and daughter in law, and Jiwon's aide in France. But first, we start with them making breakfast. Jiwon decides she'll film her unnie cooking breakfast. She tries the food and decides she needs to add more seasoning. So Jiwon ends up cooking instead while her unnie films her. She adds onions, carrots, curry powder, then tries it again. Jiwon: Wah it's really delicious. Yookyung at the side filming is like "Will you give me some too -_-" because Jiwon keeps feeding herself and not her unnie hehe. They manage to make a nice cheese soup for breakfast! Then, Dominique ahjumma come around to show something to Jiwon, which turns out to be a hedgehog called Pikachu. Because it likes to stay in the shade and thus hide under the table, Jiwon had to go down on all fours to see it haha. I think Yookyung got pricked! She doesn't seem to have much luck with animals. Jiwon carries the basket and says it's her first time seeing a hedgehog. And of course, while we're on the topic of animals, we can't forget that donkey. 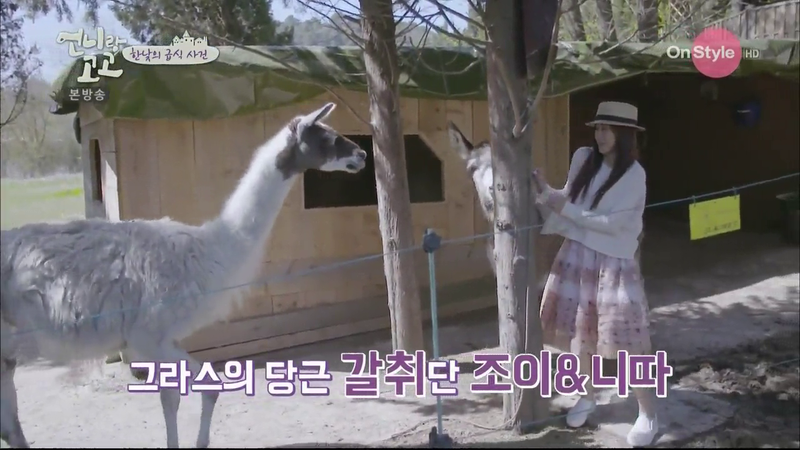 Jiwon has been in charge of feeding the animals, especially Zoe. Now when she calls out Zoe, it walks to her! Today, she specially prepared some carrot thing for Zoe. Jiwon is running to the other side of the fence to get in and Zoe starts braying super loudly. Jiwon: Isn't your display of affection a bit excessive? Then she starts asking the donkey to calm down hehehe. Nita the llama walks over too and at first she says hi, but when it walks closer, she starts backing away because she's scared haha. She starts feeding some of the carrot food to Nita, but Zoe eats it instead. Jiwon is so flustered that she gets out of that fence LOL! Meanwhile, Yookyung is preparing ingredients to make soaps and soy candles as gifts for their guests. Jiwon is roaming the garden, thinking of what to do to leave their mark there. Suddenly, she shouts "flowers!" and runs into the house. Turns out they bought 2 pots of flowers on their trip to the Grasse Weekly Market. She goes into her room and starts cutting paper to make tags for the pots. And then for some reason, she decides to start drawing faces on the eggs she received from Dominique ahjumma. She draws her 'ugly' unnie, then herself. "I'm even uglier." So to make herself prettier, she draws eyelashes too. Yookyung puts her pot of soy wax and soap on the stove to boil them, then goes back out to scrape out the pulp of oranges to use as cups. 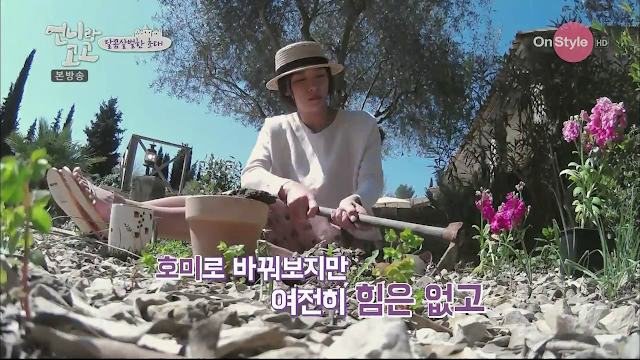 Jiwon goes out into the garden with her 2 pots of plants and starts digging in front of the olive plant. Then she gets tired from squatting so she sits down and continues digging LOLL! Jiwon arrives back at the house just as her unnie gets the news that it's burnt. She's confused (she didn't even know what was burnt) but keeps asking if her unnie is okay. Luckily nothing else got burnt and they then get to work to remove the burnt stuff from the stove. Yookyung looks at her pot and just sighs while Jiwon lies down on the sofa from shock hahahaha. Now that she's finally calmed down, she goes back to the garden and puts the tags in front of the plant - 1 of her unnie's name and 1 of her name. It's really quite pretty. I'm impressed! Jiwon says that she thinks doing this is more meaningful. Gotta say this is a good idea. Well done, Jiwon! Yookyung continues to make her candles and soap while Jiwon gets ready to go the supermart! She's going alone this time, and it's apparently her first time driving on her own. Yookyung: It's her first time driving on her own. But seeing her skills the past few days, she's more than capable of doing it. Awwww she's soooo happy to be driving. Then she's like "I can drive with one hand." and raises her hand to show it LOL. She nearly gives me a heart attack by driving into the other lane. What a road hazard!!! She smiles when she spots a place to park her car and promptly parks her car in the middle of 2 lots. She reverses and looks like she's about to adjust her position.....except she goes in again and she's STILL in the middle of 2 lots. 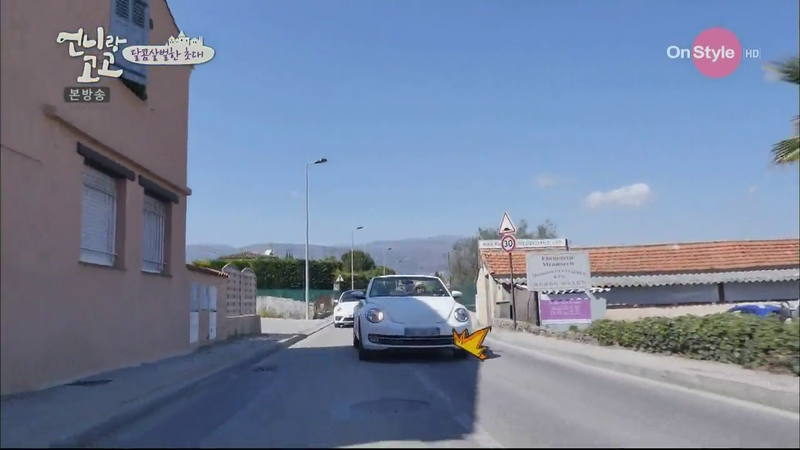 Then she pulls her brake and gets out LOLLL!!!! She tries to buy cheese first. She can't find the cheese she's supposed to get but the staff don't know what she's referring to either. She's like "What was it?? I'm confused." and starts going up and down the cheese section. The crew asks Yookyung what Jiwon is going to buy. Yookyung: She's didnt tell me what exactly she was going to buy. I think she'll buy delicious food. Haha so much faith in her sister. In the end, the very confused Jiwon ends up buying 3 types of cheese. She then goes to the delicatessen to get beef for bulgogi! She suddenly adds some bgm with her "jjajjan!" complete with hand action and the staff looks up with a quizzical look hahaha. She asks her usual "C'est combien?" and it turns out to be expensive. "Don't they give service?" Service which is what Koreans call free stuff. But nope! She continues her grocery shopping when suddenly, "annyeonghaseyo!" Someone is asking for her autograph on the newspaper which she appeared on. "Yeah, it's me!" hehehe why so cute. Wow that lady watched Secret Garden! So she actually knows who Jiwon is. So coooool. She then goes to buy dessert and asks the staff what's her favourite dessert lol. She buys 2 lemon pies and 2 chocolate pies, then realises they have 5 people so she needs to buy 1 more. She pays and is about to exit when a staff stops her and asks if she's the person on the newspaper. Jiwon didn't realise that the front page corner was just a preview and there was an entire page on her inside. So she decides to buy 2 copies. And then she spots the cashier who served them on their last visit who had asked for her autograph. While paying for her newspapers, she points at it and says "It's me!" LOL. And she does the usual tourist thing of extending her palm with all the coins inside while the cashier just picks out the correct amount haha. While walking back to her car, she's soooo happy and keeps giggling. "I must show this to my mum. There are many magical things happening." She finally removes her public nuisance car and starts going "Ha Jiwon jjang! Jiwon jjang! Oh yeah! I'm feeling great. But where should I go?" Jiwon: It really feels like I can live here alone. Today I drove alone, went to the mart alone, talked to people, the people in the neighbourhood knew and remembered me. It seems like I can make friends soon too. So I really really like it. Jiwon: Omo. I forgot to buy seafood onion pancake. Oh my god. Pabo pabo pabo pabo. I'm going to get scolded by unnie. Jiwon: Ahhh...I forgot about the seafood onion pancake. I must be stupid. Upon reaching back home, she's like "Why is the distance so short? I like driving." 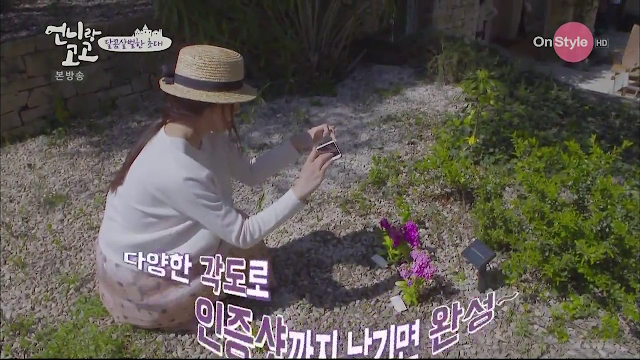 She then immediately shows off the newspaper article to her unnie and says she'll show it to the guests later. Jiwon: You can't take this. Yookyung: Why would I take it?? Yookyung shows Jiwon the candles she's finished making. And Jiwon tries to put her newspaper with them haha. She's soooo proud of it, it's super endearing. But when Yookyung asks whether Jiwon bought the sauce to make the seafood onion pancake, Jiwon says "When I saw this (the newspaper), I forgot about that and didn't buy it." But they decide they can make do with what they have so it's fine. It's 4:30pm and they need to start preparing for the dinner which is at 6:30pm. Jiwon: I do it often. I like home parties so I have and buy a lot of pretty table settings but to be honest, I only do the setting and my mum does the food or I buy it from outside. Jiwon starts taking out cute plates and wine glasses and sets them outside. Then she finds another type of wine glass and decides to use them instead so she runs in and out again. So she's just been running in and out doing the setting and is tired already hehe. Jiwon spies the table mats which are crumpled so she decides to iron them. She asks if the iron has water in it, then leaves the iron on the table mat while she does other stuff (!!!!). She decides to change the wine glasses for the table inside, goes and praise her unnie, washes the wine glasses, continues setting the table all while the iron is still on the table mat. And then she finally realises she left the iron and the mat is already burnt lol. She continues ironing the rest of the table mats. I'm just amused she finds the need to iron them. I've never heard of people ironing table mats before. 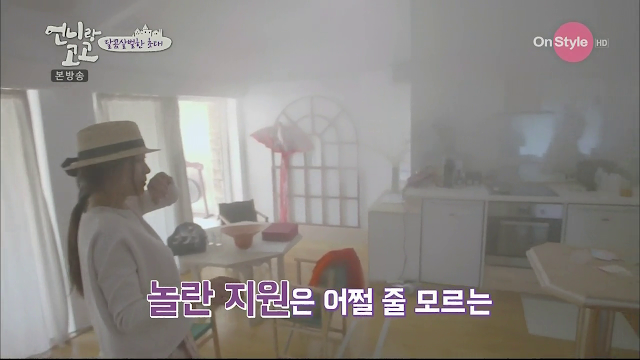 Meanwhile, Yookyung is cooking the tomato soup when she suddenly screams. Turns out the camera dropped from the wall. Luckily it didn't drop into the soup! Finally, Jiwon decides that she should do some cooking. She gets the tomato and mozarella cheese out to make caprese. Yookyung comments that this is like those cooking competitions with time limit so that's how it's edited with dramatic music and all. Except our masterchef Jiwon needs to refer to her recipe book again before starting lol. And then she says the knife is lousy because she can't cut the tomato properly. Yookyung: You can just use the mini knife to cut it. The final product looks good, but it's really quite easy to make haha. Then Jiwon moves on to preparing the bread. By the time she's done, its already 6pm. Yookyung is cutting the soap she made into little pieces and Jiwon goes to talk to her and then suddenly they only have 5 minutes left! So Jiwon starts running to put the food on the table. "This is terrible. Speed speed!!" And omg lol she really puts the newspaper on the table too with all the food. "Music!!!! We must have music!!!!" So she runs in to get the speaker. "Ahhhh!!!! Bluetooth!!! The bluetooth doesn't work!" So she runs in to get the cable. The guests aren't here yet but they will be soon enough. To be continued in the next ep! And omg is she an actress or a comedian? Why is she so entertaining?